It’s a beautiful June day, the perfect day for a walk in the garden and having you along makes it even more perfect, for you know what I always say – sharing doubles the joy! 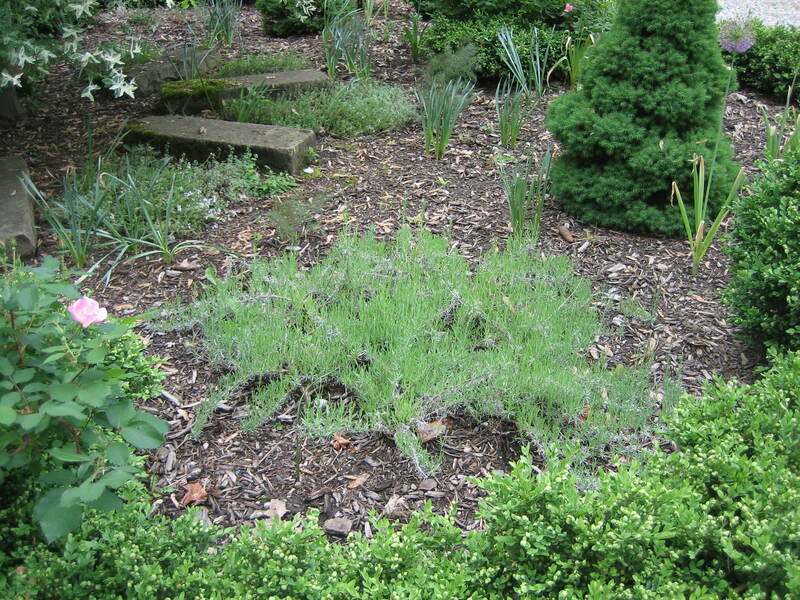 I was busy this morning planting lamb’s ears and dusty miller to keep my spirea and viburnums company. 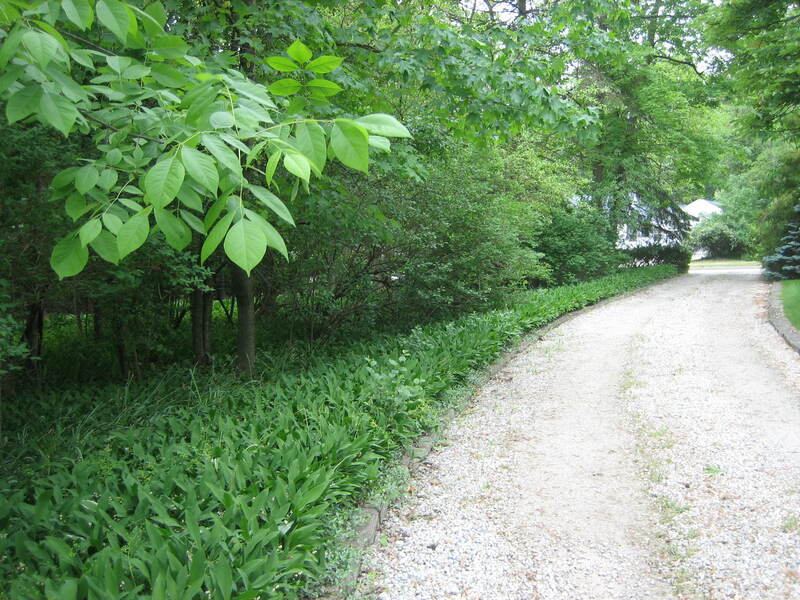 These plants are situated in front of our barn. 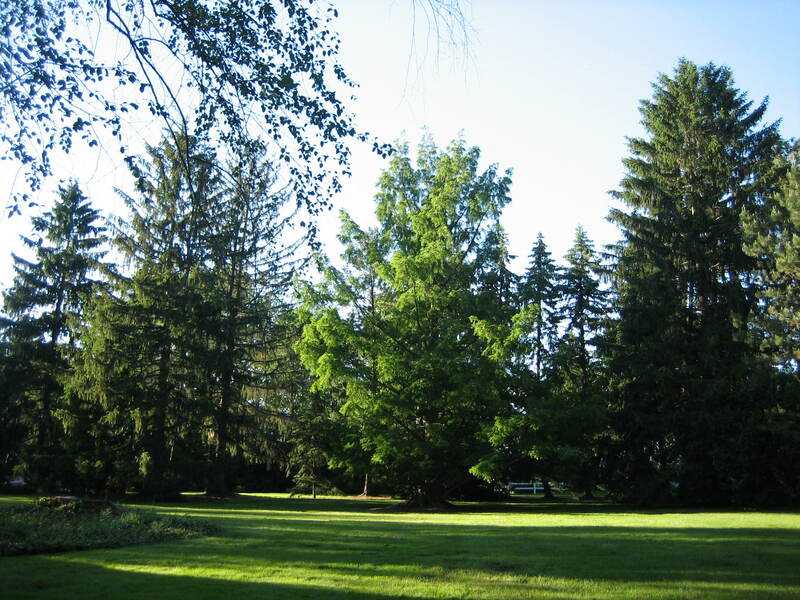 They are joined by evergreen trees, very old honeysuckle bushes and a red maple. I thought the greenery needed something, and adding white plants is a first step in order to create a little interest but still keep the peace. What do you think? It’s hard to capture the whole area in a snapshot while at the same time being close enough to focus on the small white plants, but perhaps you get the idea. This area has a way to go, but I’m working on it. I just love lamb’s ears, don’t you? 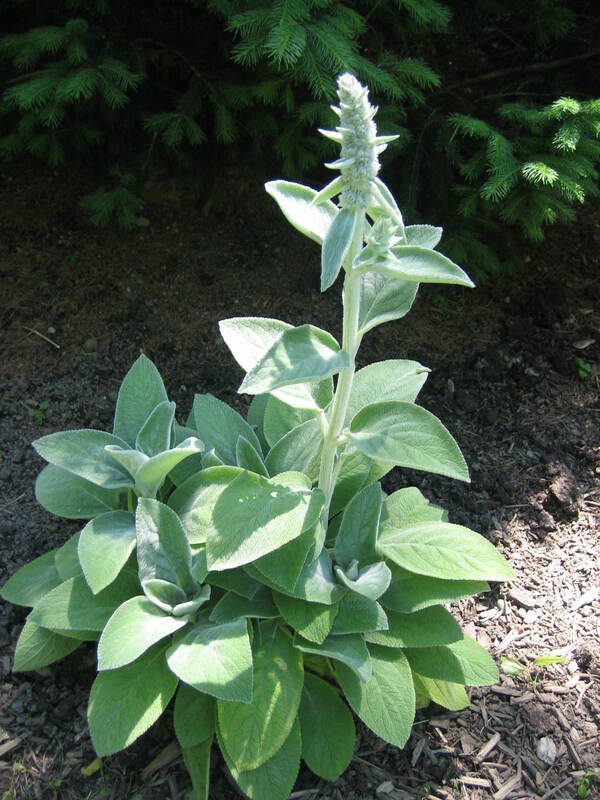 Lamb’s ears are also known as Wooly Betony. I remember this plant in my father’s garden. My father was a fantastic gardener. Maybe that’s because he grew up on a farm. His family’s farm was in Pennsylvania. I would be in heaven if my father could be here with me these days working side by side with me in my garden. I know my father would love all my land for here he would never run out of projects just as I don’t. He’d love my barn for it would remind him of his childhood days on his family’s farm. I would love my father’s expertise and help for some days I don’t know what to tackle first and I have so much to learn. But my dad can’t be with me because he’s already in heaven. Now he can only join me in spirit, but I’ll take that. Because he loved nature and gardening as I do I feel he is with me when I’m working outdoors in my yard and that makes my gardening work extra enjoyable. In my Dad’s last years he was in a nursing home suffering from Alzheimer’s disease. He stopped speaking except to say the phrase “that’s a big one”. Those words made no sense at the time, but now whenever I’m working in my garden and I chop into a big root or see a big mushroom I’ll say “That’s a Big One!” and I have the distinct feeling my Dad is with me. This makes me very happy. It’s good to be a spiritual person. It really is! Well, let’s move along. I’d like to show you my herb garden. It’s just a few steps away, but here’s a view of it from one of the upstairs windows. 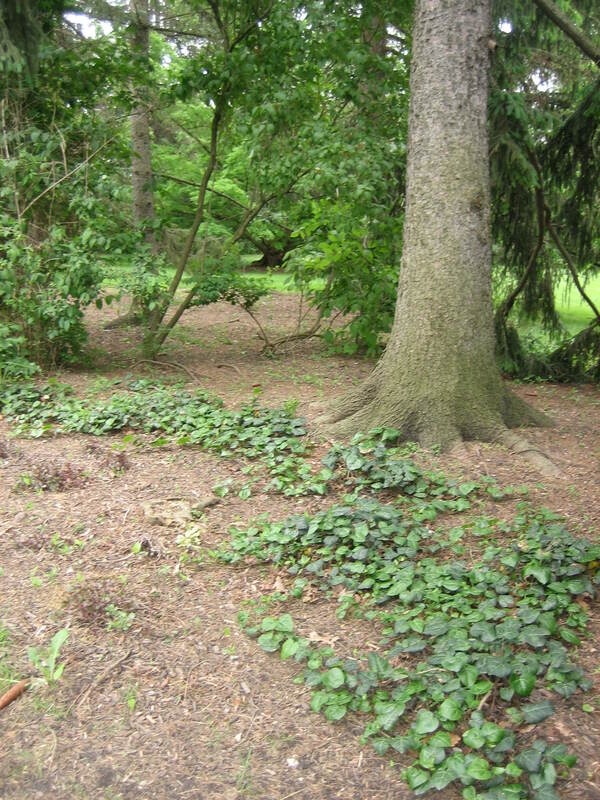 In this next picture you can see where it is in relation to the plantings I just showed you in front of the barn. 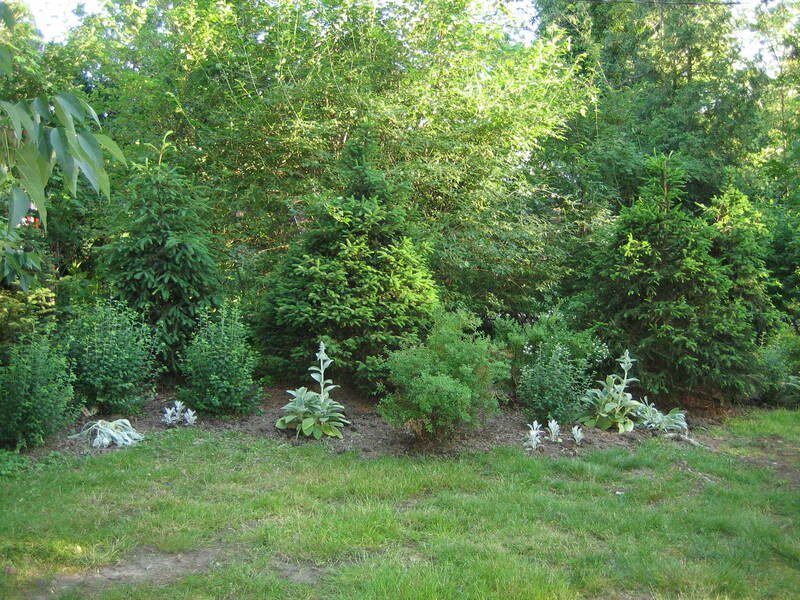 You may have noticed there’s a design going on in the herb garden – mini and larger boxwood mixed with roses and spruce. 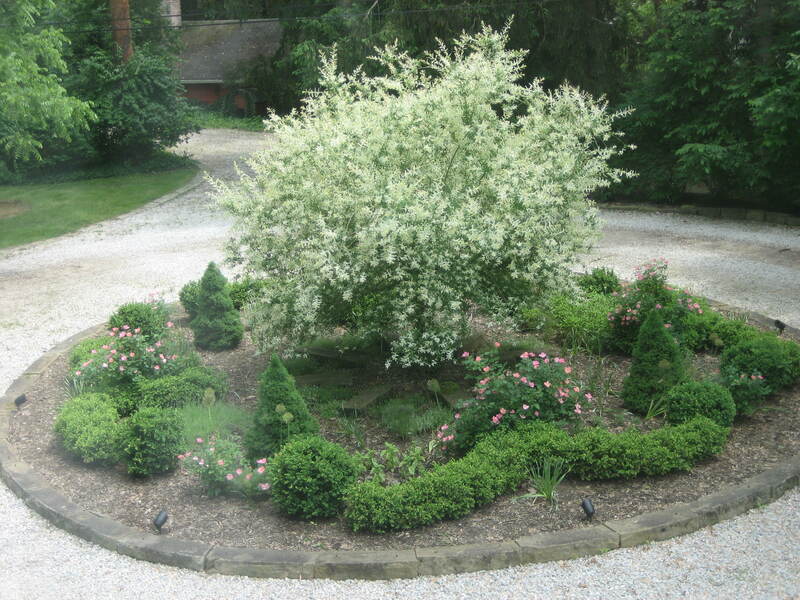 In the center is a dwarf Japanese Willow that is in need of pruning. We’ll get to that one of these days. 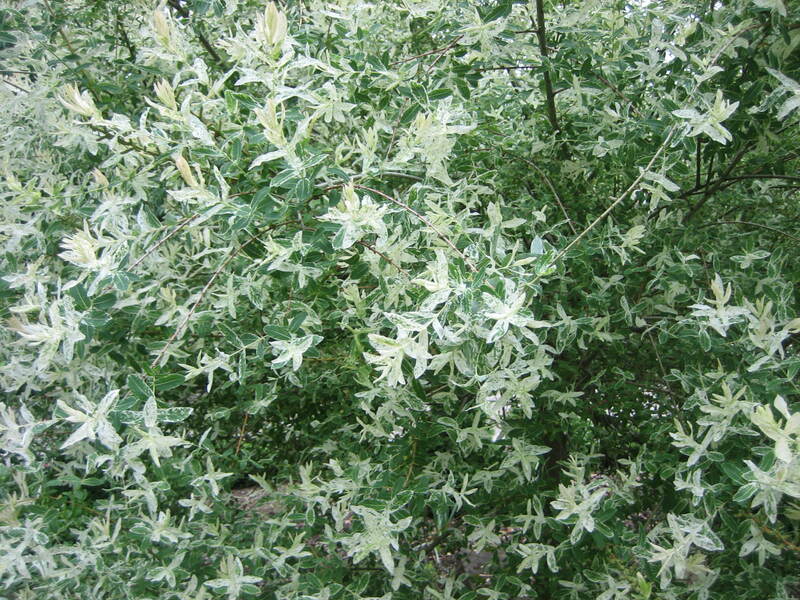 The leaves of the Willow will turn green as the Summer wears on, but aren’t its white leaves enchanting? I fell in love with this type of tree when I first discovered it in a friend’s garden. 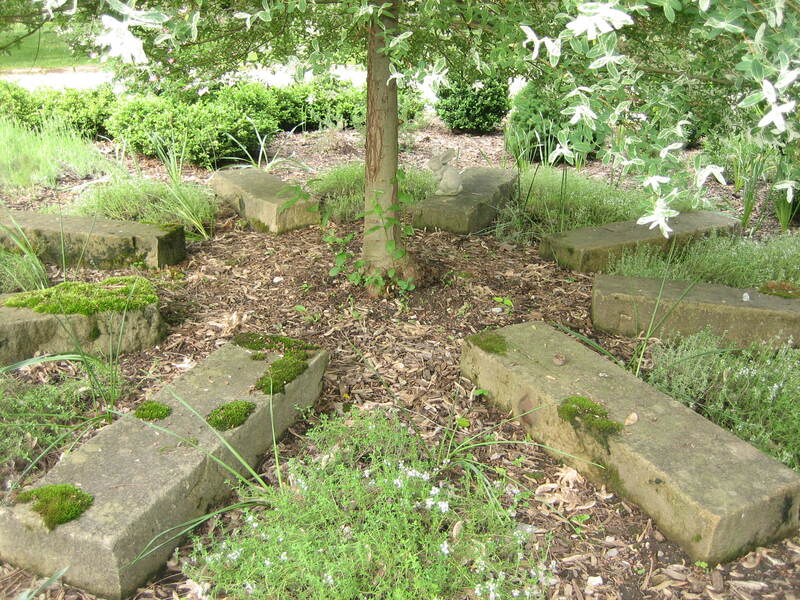 At the base of the tree are large rectangular stones set like the spokes of a wheel. In between these spokes I planted thyme. 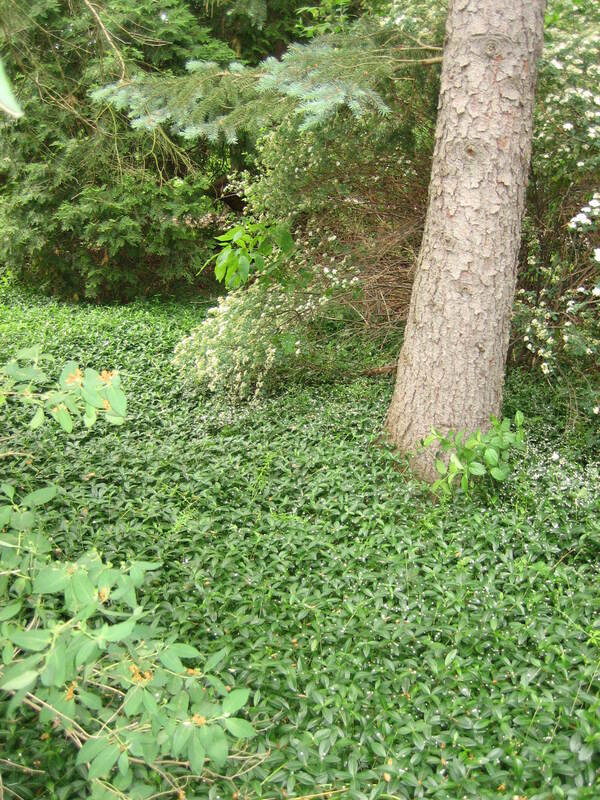 In each indentation of boxwood a different herb is planted. 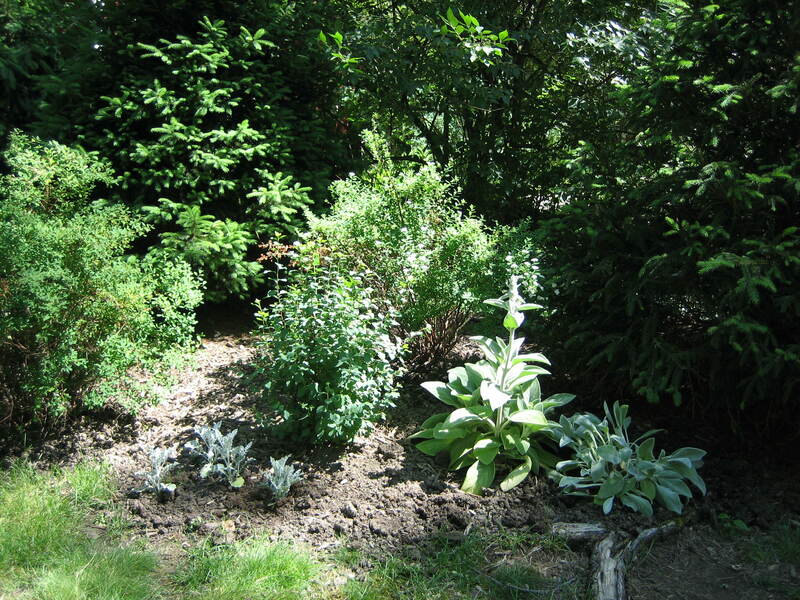 It’s early in the season so all the herbs are still rather small, but in this sunny spot they will flourish. Here’s what my herb garden contains: Basil, Lavender, Rosemary, Tarragon, Marjoram, Mint, Summer Savory, Sage, Fennel, Thyme and Chives. 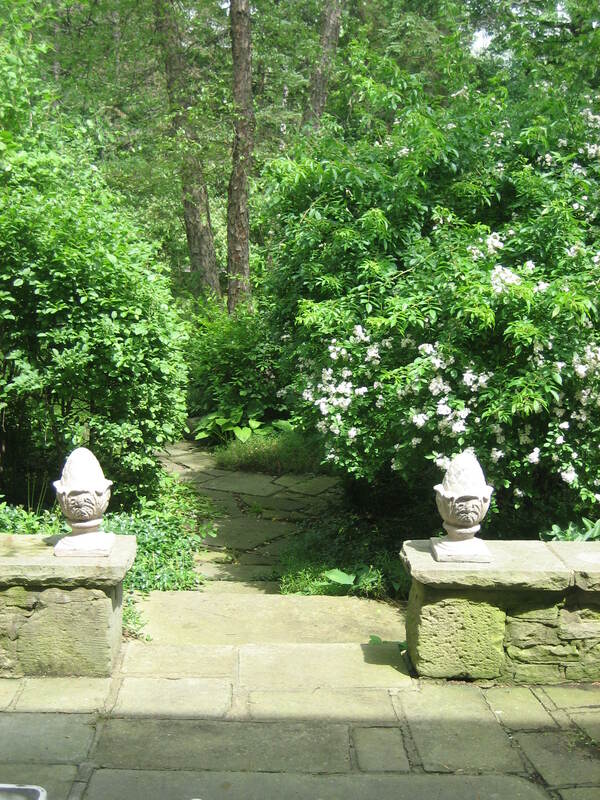 This is a view of the herb garden as if you were walking up to it. The Willow tree doesn’t seem very large in this picture but after only a few years growth it is now about 20 feet tall yet compared to the old trees of the Secret garden set behind it the Willow seems very small indeed. 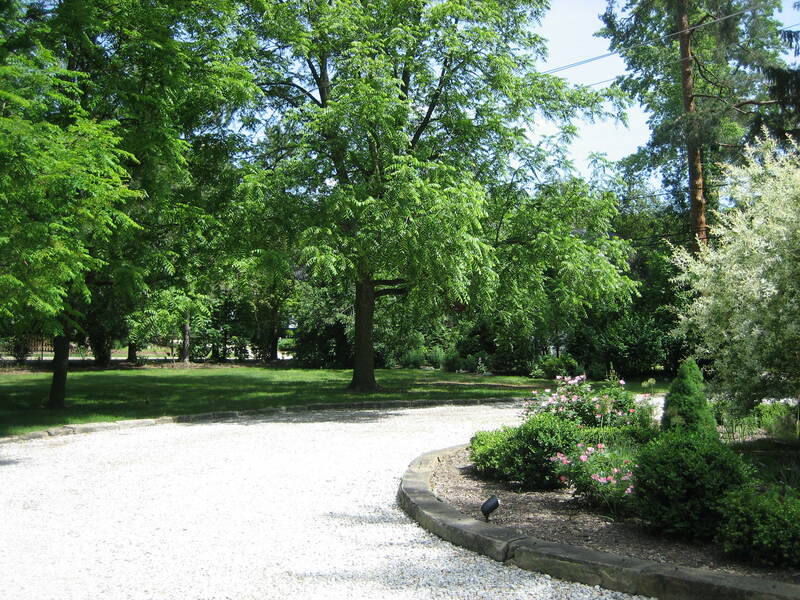 When we moved to this property a few years ago the circle contained a very old and sick apple tree. Around it were a jumble and I mean a JUMBLE of perennials and weeds. This circle was a project and a half! 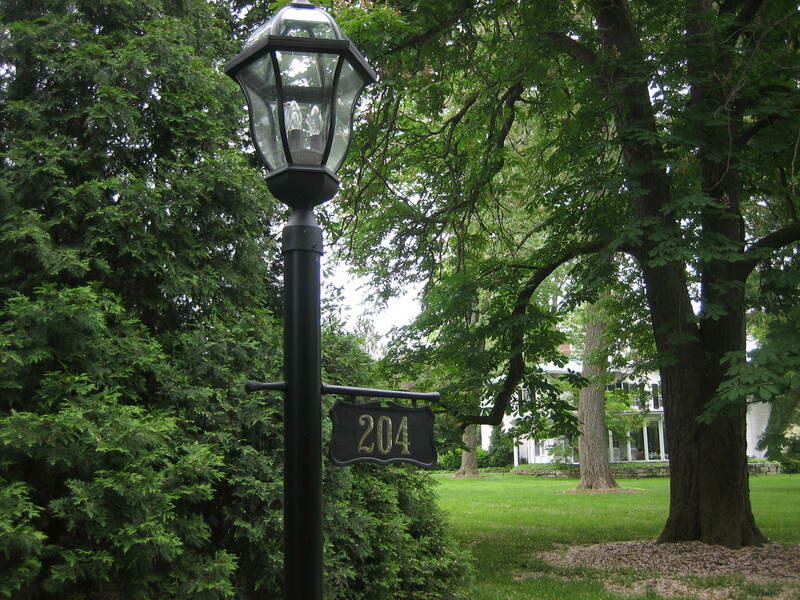 We added bulbs for Springtime and lights for night time. Now just to keep it weeded. I grow other herbs in my patio garden. 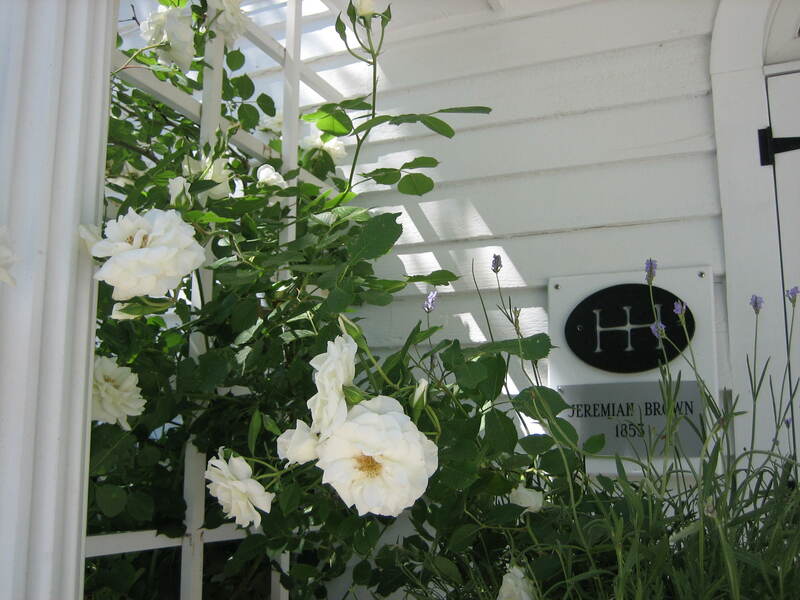 I’ll show you that area another day but now take a look at my climbing rose at our entrance door. It’s a delight! It greets me and my guests every day. The rose is going to town this week with flowers galore. This rose is about three years old. It took this long for it to look robust. I love this flower. Roses are my favorite flower. 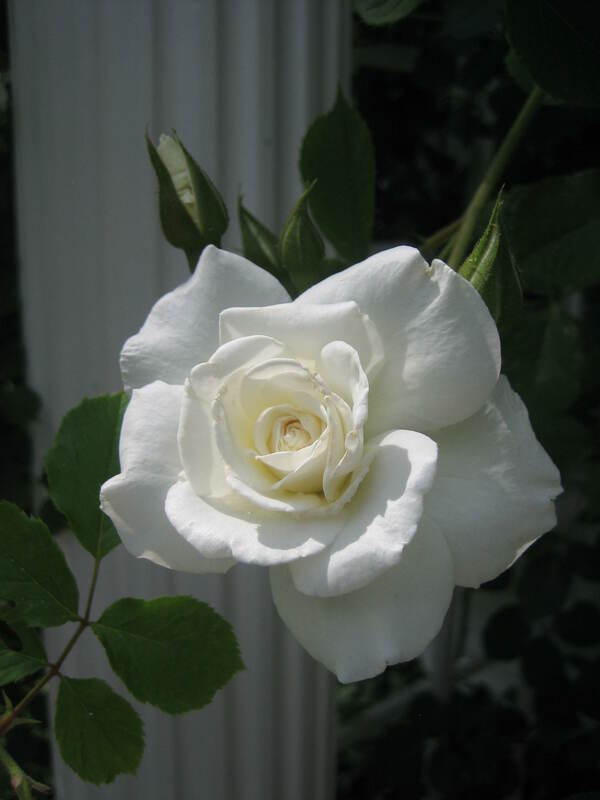 Did you know the rose has been associated with love and with marriage for centuries? Having many rose bushes in the garden assures me of a rose on my nightstand every night – at least at this time of year. 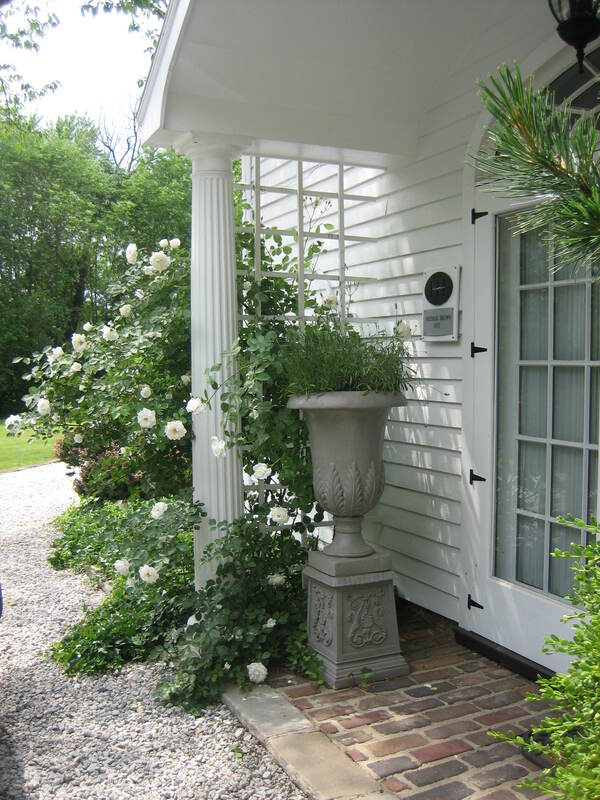 The roses mingle with the scent of lavender for lavender is growing in the urn beside the trellis. Old fashioned fragrance for an old fashioned house for an old fashioned girl. The plaque on the wall states the name of the house’s first owner and the date the house was built. Now let’s walk down the driveway. 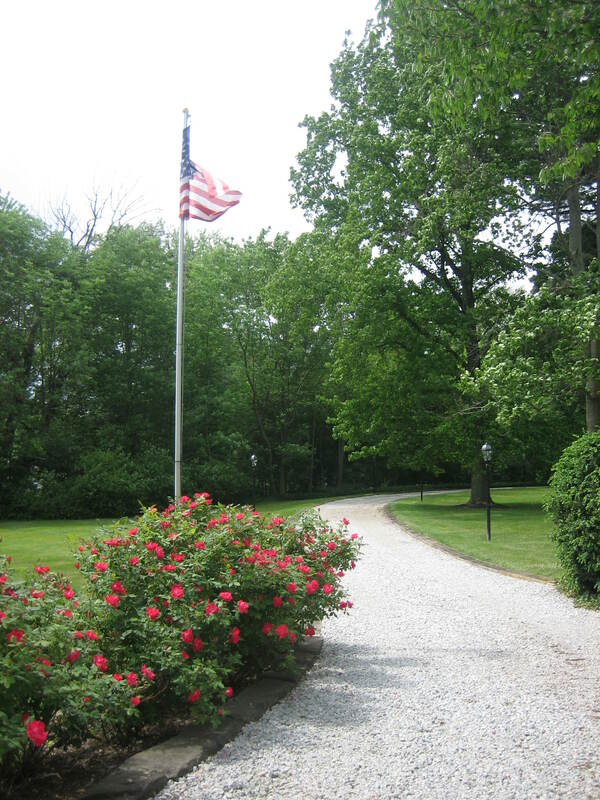 We’ll first pass some knockout roses and the flagpole. 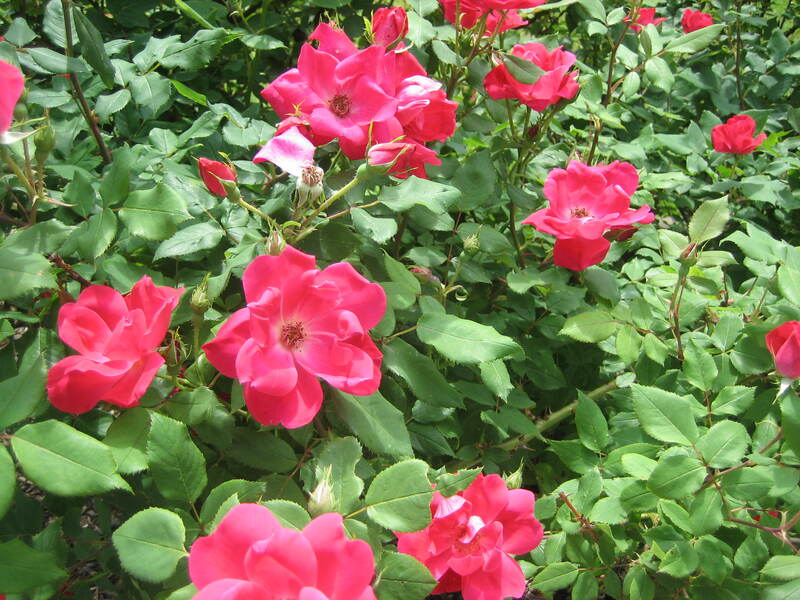 Aren’t knockout roses wonderful? They never stop blooming. 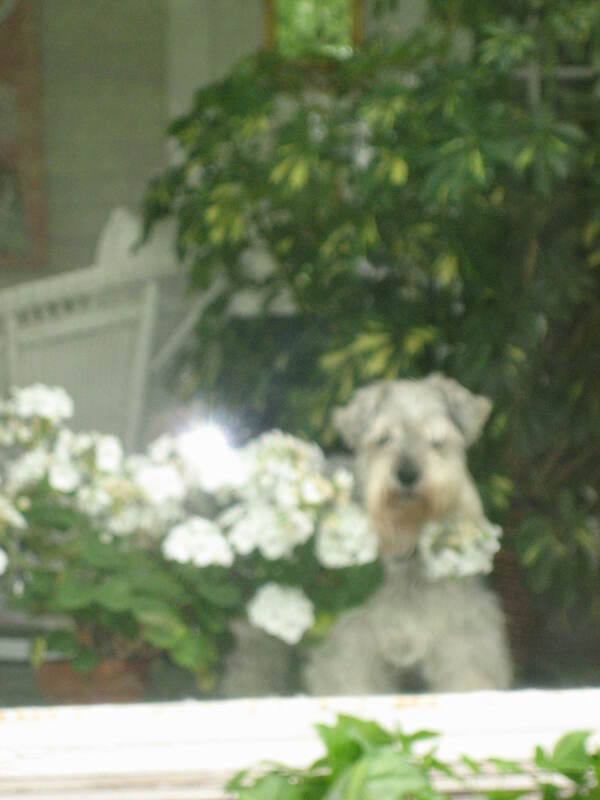 And look who’s watching us from the porch window! He’s doing much better these days, eating again now that he’s getting people food. Ha! Tomorrow he goes to the beauty shop for a grooming. Here we are at the base of the driveway. It’s lined with Lily of the Valley. These plants were put in by a former owner. 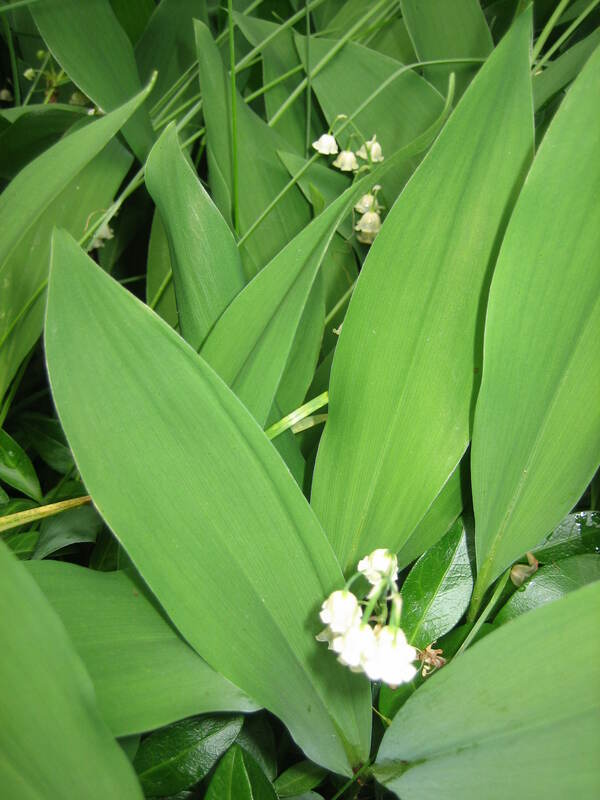 They’re thick as thieves now – another charming old fashioned flower. How do such tiny flowers produce such sweet scent? “What was Paradise? but a garden, full of pleasure, and nothing there but delights. 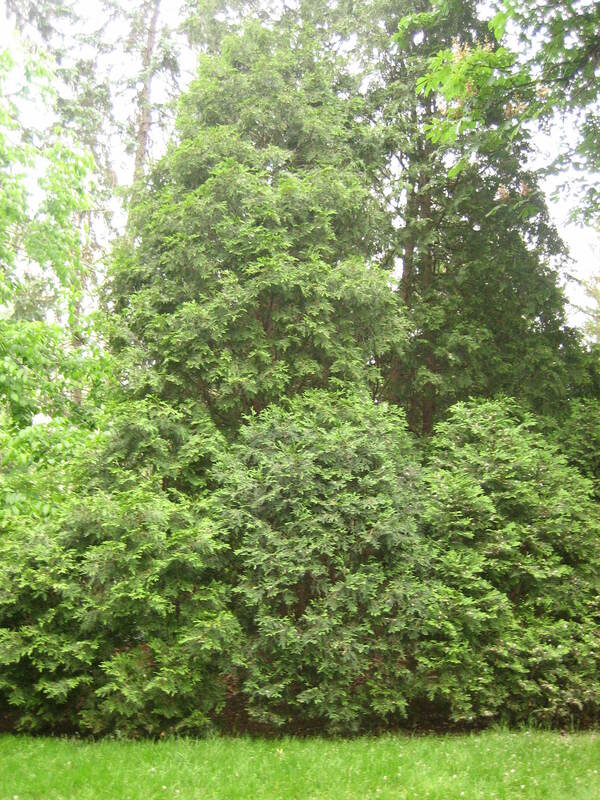 At the front of the yard there are very large trees and bushes which line the sidewalk. They must be 150 years old like the house. 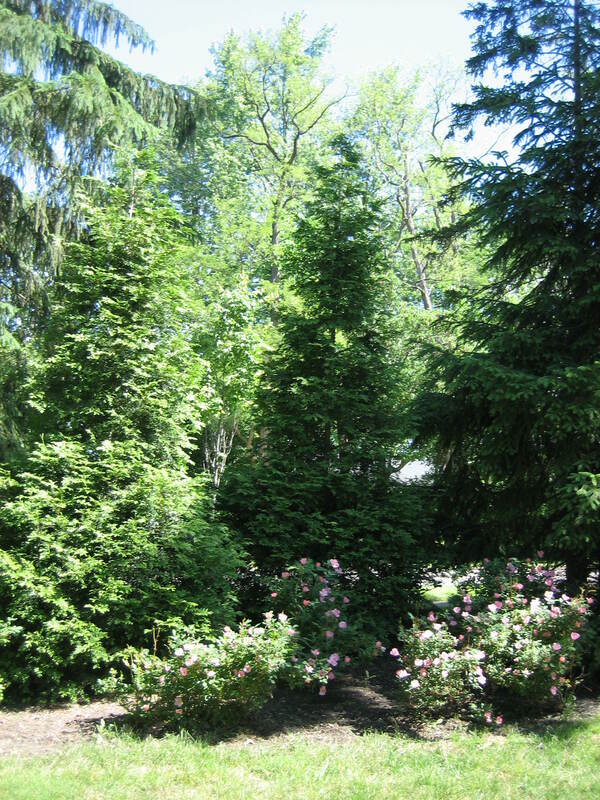 and he planted the many evergreens too. 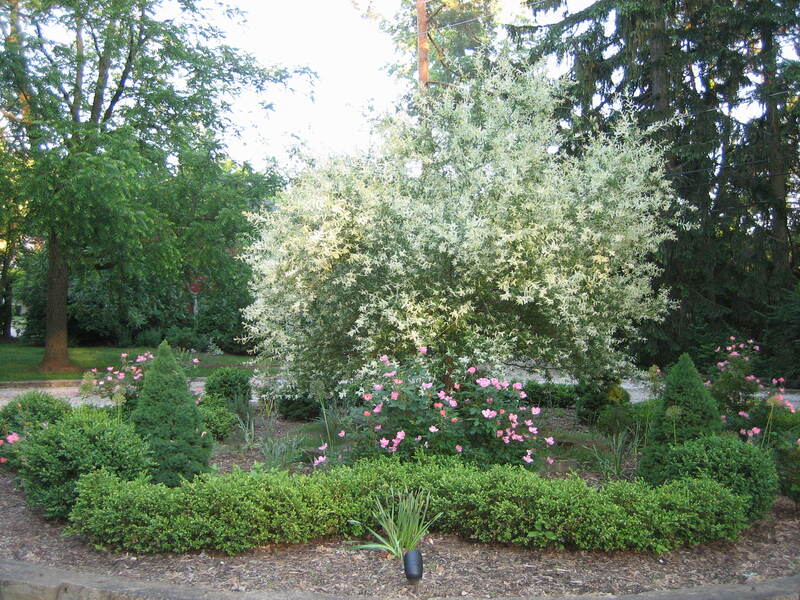 I am trying to establish roses and various ground covers in little pockets of space between the trees and shrubs, both along the outer area of the beds at the sidewalk, and at the inner areas along the grass toward the house. 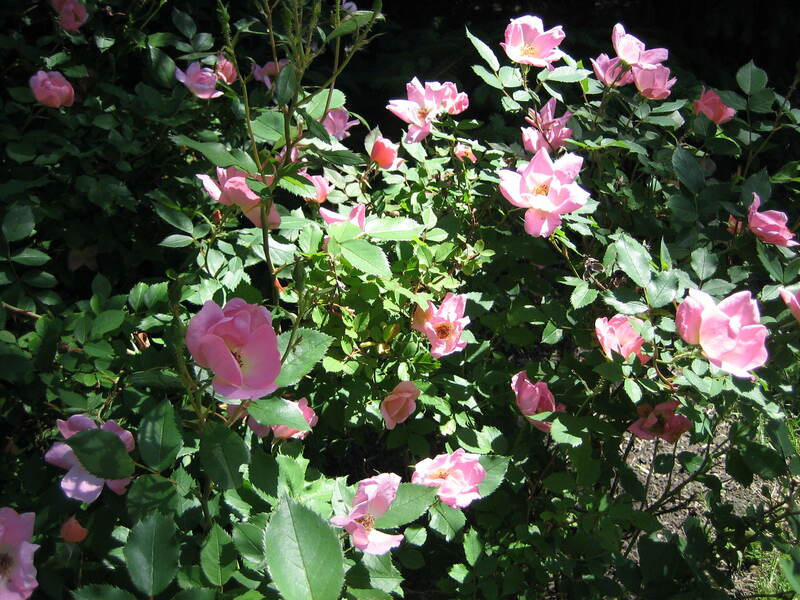 The roses here are a lighter pink in color. And in the picture below you see Myrtle that’s quite established. The Spotted Deadnettle, sometimes called “White Nancy”, on the other hand has a way to go in order to fill in the space provided, but it’s coming along. 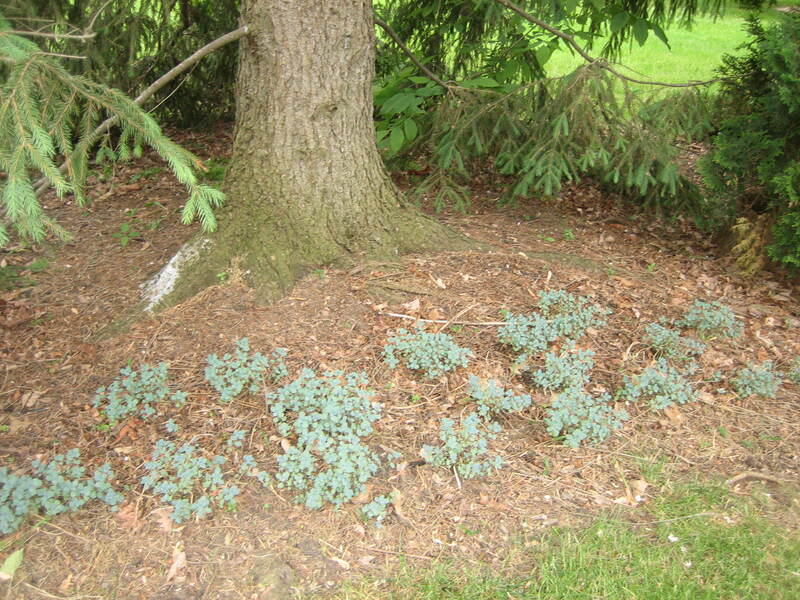 and I’m hoping these little bluish plants spread in future days Are they called Stonecrop or “Lidakense? 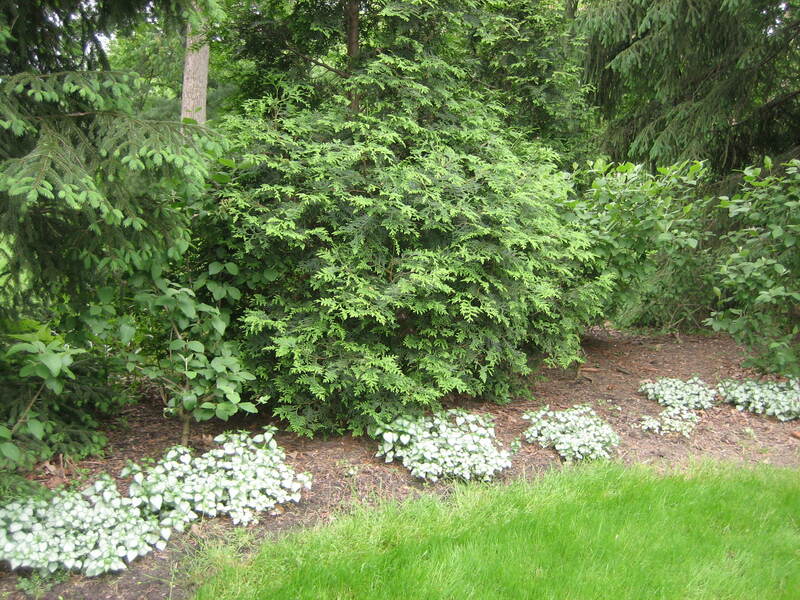 My plan is to get these various ground covers established so there won’t be as great a need for mulch from year to year. Some large open areas will get mulch, but hopefully these smaller areas will have a variety of plants covering the ground. Oh, I also purchased some Sweet Woodruff or Galium Odoratum”, but I haven’t planted it yet. Well, let’s head back to the house. When we get to the back yard we can sit and relax for a while. Maybe you will tell me about your garden. You can do that by clicking “comment” at the end of this post. I’d love to hear from you. Really I would! And here we are. Can I offer you an ice tea? 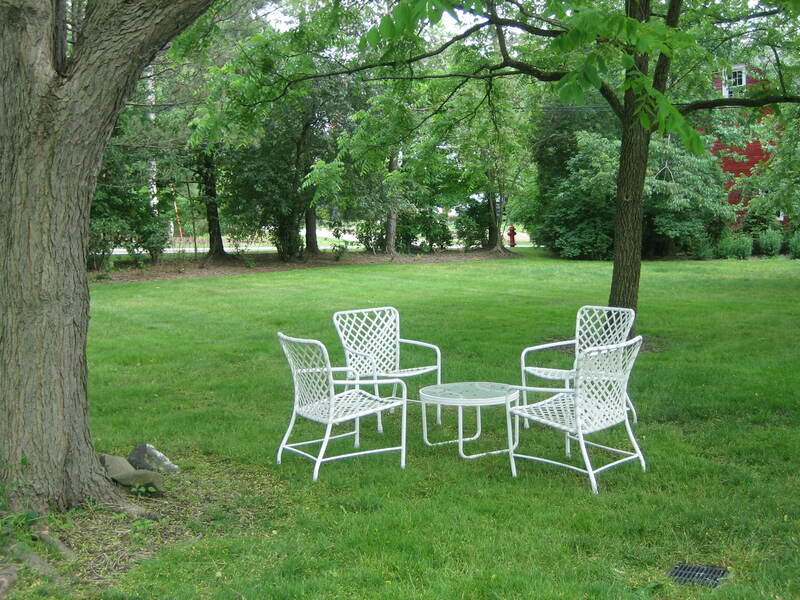 Let me tell you about this lawn furniture, how it was almost stolen years ago, way back when we lived in Boston. This furniture was set out on our patio at our very first garden apartment. In those days we lived on the main floor of an apartment building. Our patio looked out toward a brook where ducks swan by on a regular basis. It was a very pretty apartment complex because the brother of the owner owned and operated a garden nursery so he tended the grounds. The lawn was perfect and was equipped with a sprinkler system. There were flowers everywhere. It was usually a very safe place too, but some neighborhood boys decided they wanted to get into the furniture business. By that I mean they decided to steal garden furniture and resell it making a sweet profit for themselves. Sadly, we thought we best get a chain to secure our new furniture, so one sunny Saturday we went off to the hardware store. We bought a chain and lock, but as we entered our apartment I could see through the sliding glass door a young man carrying off some of our very own furniture. WHAT? How dare he! It was broad daylight and neighbors were out and about. The nerve! Without thinking twice I tore after that fellow yelling all the way and he dropped the furniture and took off. SUCCESS! … so I have it today. Hurray for me! I bet you have a few good stories too. Do share. Sharing doubles the joy! It’s been fun showing you around part of my garden. I’m glad you stopped by. Another time we’ll explore the Secret garden. (That’s what I’ll be working on later today). Tomorrow I’ll be having another tea. This next tea will be on the patio. 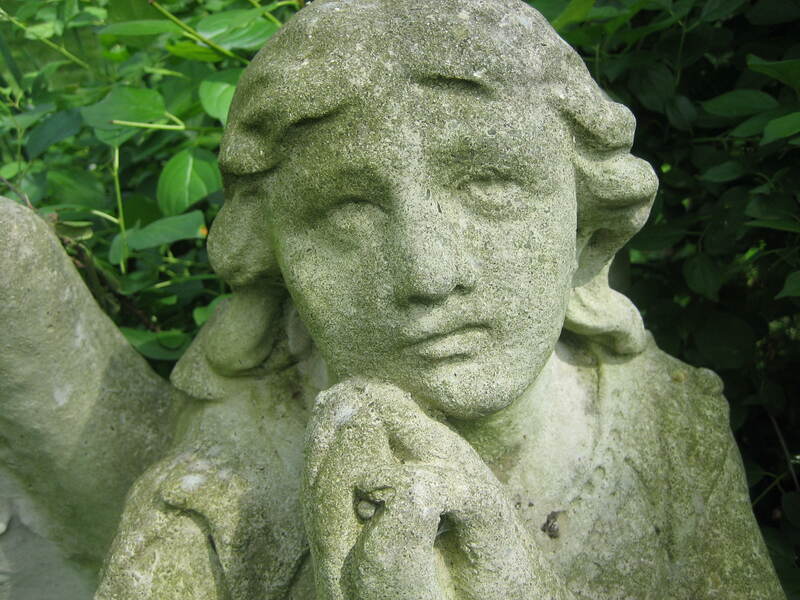 I know you can’t come in person but perhaps you’ll come in spirit when you read about it some future day. I’ll show you around the patio garden at that time. But before you go, let me leave you with these parting words. So thanks for joining me! I really enjoyed our trip around your garden. Can’t wait for the next installment!! I’m so glad you could join me. I’ll be busy with my tea tomorrow, but then I’ll enjoy sharing it with you. 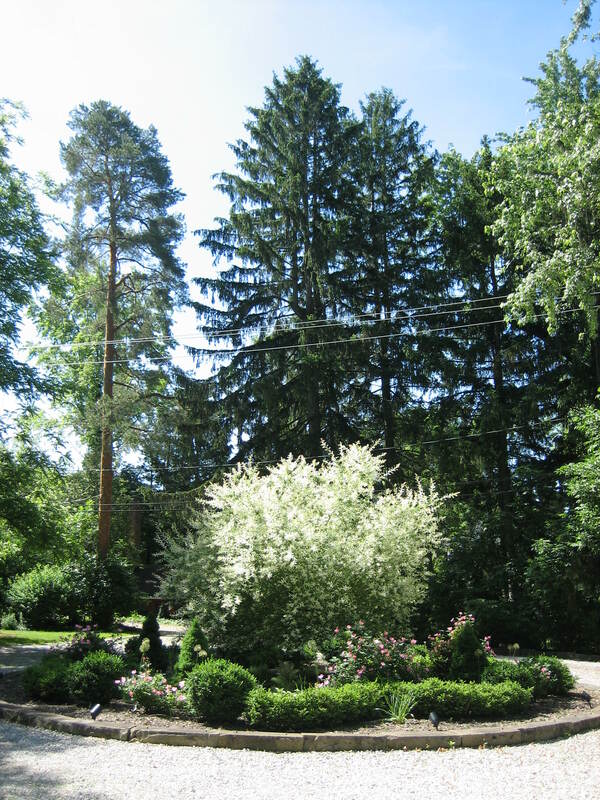 Beautiful grounds and lovely pictures. Thank you for sharing them, CarolAnn! Always a pleasure to share with you! Soon I’ll be sharing a letter with you too. Can’t wait, but today is another tea. Much to do. Very beautiful Carol. This was a lovely read this morning. I spent all day yesterday in my own garden. My dear cousin, it is so nice to hear from you. We must try keeping in better touch.